On Thursday, September 12 in honor of Star Spangled Music Day, a dazzling exhibit will open in celebration of the #Anthem200 anniversary. 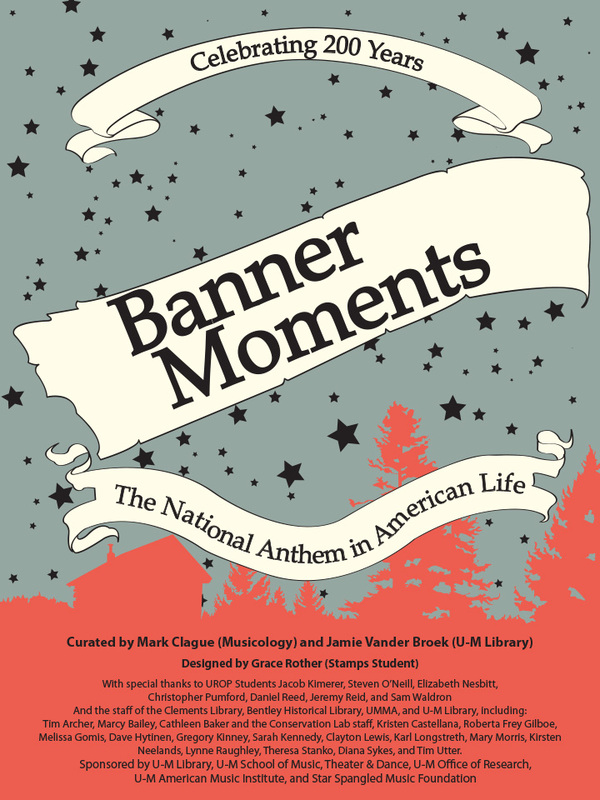 Titled “Banner Moments: The National Anthem in American Life,” the exhibit features items from collections drawn across the University of Michigan’s archival holdings, including one of the dozen or so surviving copies of the first sheet music publication of “The Star-Spangled Banner,” rare souvenir pressings of Jimi Hendrix’s Woodstock Anthem, and programs and artifacts from Wolverine Football history. The exhibit is housed in the Harlan Hatcher Graduate Library on the University of Michigan’s Central Campus in the north lobby, Room 100 Gallery, and Audubon Room. It runs through mid-December, but kicks off with a 4:00 p.m. concert featuring students and faculty of the University’s School of Music, Theatre & Dance. Musicologist Mark Clague, librarian Jamie Vander Broek, and Art & Design student Grace Rother collaborated on the exhibit. August 1, 1779—Francis Scott Key is born. This entry was posted in Banner Moments, Mark Clague. Bookmark the permalink.